BREAKING NEWS: Italy reduces its GDP forecast to 0.1% from 1.0% this year. This action will increase its deficit/GDP ratio. The IMF lowered its world GDP growth forecast for 2019 to 3.3% from 3.5%, which was a bigger decline than forecast. Brexit: PM May is on the continent to ask for an extension. She wants to stay in the EU until the end of May. There are some in the EU that want to give her a flexible extension for a year, but allow the U.K. to leave sooner if a deal is reached. May is reluctant to accept a long delay as it will be seen by Tory Brexit supporters as a delay with no end. Meanwhile, talks between May and Corbyn continue on the idea of a customs union with the EU. A customs union has its own problems (it would prevent the U.K. from striking deals on tariffs with the rest of the world, for example), but, politically, it would only pass with a subset of MP votes from Labour and the Conservatives. This could split both parties and lead to a political realignment. Another complicating issue is that if the U.K. stays past mid-May it will need to participate in EU elections, which is something the hardline Brexit supporters loathe. There are probably four potential outcomes this week. The most likely is a short delay with promises of extensions. We doubt a workable deal can emerge from Parliament and we don’t expect the EU to force the U.K. out of the EU. A long delay is the second most likely result. But, in any case, a hard Brexit is the least likely outcome, which is reflected in the financial markets. The GBP remains steady despite all the uncertainty. China/EU summit: Meetings between the two sides begin tomorrow. Talks have taken on an air of urgency as the EU has become increasingly hostile toward Beijing. We suspect European leaders are seeing two major threats from China. First, China is using its Belt and Road project to divide Europe. Italy’s recent decision to sign a memo of understanding highlights this risk. Second, China is moving up the value chain and ruthlessly using state power to dominate industries and using direct purchases of European companies to favor Chinese supply chains. China is framing the dispute as the EU following Washington’s lead, but the reality is that Europe has discovered China is becoming a geopolitical rival to the U.S. and it has no good response. EU tariffs? The Trump administration is considering $11 bn in tariffs on EU goods. This proposal is partly in response to a WTO ruling that EU aircraft subsidies harmed U.S. interests. Oil news: India is delaying its purchases of Iranian oil, awaiting U.S. decisions on sanctions waivers. Frackers are using production methods that boost production quickly but also dissipate wells rapidly. This is leading to faster depletion rates and excess output of associated natural gas. The faster depletion rates mean drilling must continue at a rapid pace just to keep production steady. If investment begins to decline, oil supplies could tighten further and support oil prices. China v. bitcoin: Chinese officials are considering banning bitcoin mining. China is the world’s largest producer of technology designed to mine bitcoins but the National Development and Reform Commission (NDRC) argued that the mining itself is wasteful and should not be permitted. We have wondered for a while why China would permit such activities; bitcoin has become the vehicle of choice for criminal activity and would be a currency outside of state control. The position of the NDRC would seem to be more consistent with the degree of social and political control the Xi government supports. Tech regulation: The U.K. is considering a measure that would penalize social media firms for allowing harmful content to be posted on their platforms. Although the rules would only apply to the U.K., they could become the basis for regulation in other countries. If it becomes law, it would force the social media platforms to more systematically police its user-posted content and dramatically increase its cost of doing business. The U.K. regulation could be part of more regulatory actions in other nations. Chart du jour (plus one): Although equity values continue to trend higher, retail investors are still shying away from stocks. This chart shows the S&P 500 with retail money market funds as measured by ICI. In 2007, money market funds rose rapidly as the real estate crisis unfolded. This area, shown in gray, coincided with market weakness. The decline in money market funds coincided with the beginning of the current bull market. We have also placed orange areas on the chart that show periods when money market fund levels fell below $920 bn. Equities tended to stall during these times. 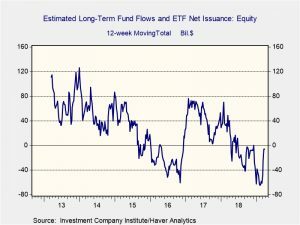 Since mid-2017, we have seen a steady rise in money market funds and levels rose above $1.0 trillion in early 2018, which also ushered in a period of broad consolidation. 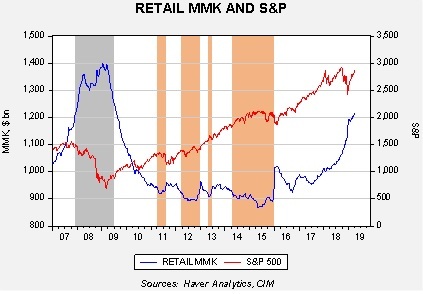 The pattern in retail money market funds is similar to what was seen during the panic in 2005-08. The recent rally in equities does not appear to be supported by falling retail money market levels. Company buybacks are thought to be supporting equities. Still, without the return of retail investors, it is difficult to see how this rally could extend much further. 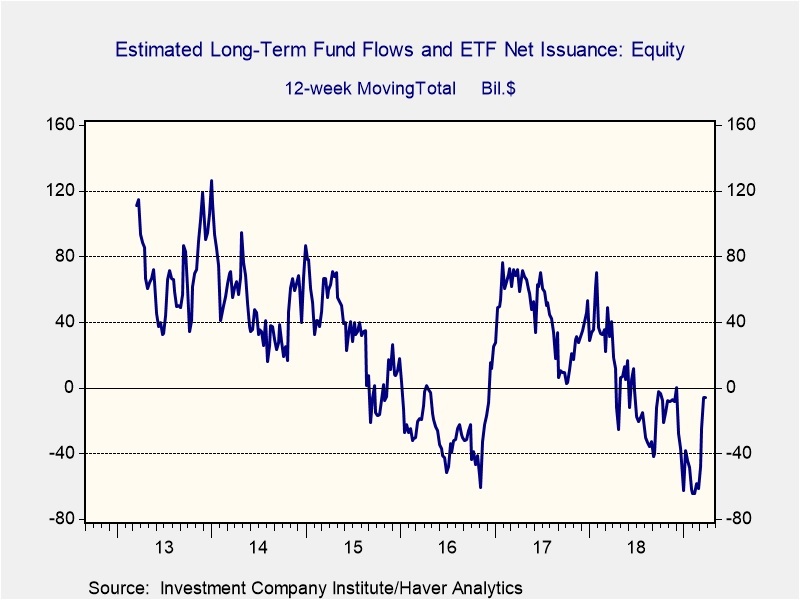 We note that flows into equities in the form of mutual funds and ETFs have been mostly negative since the middle of last year. Note that flows were negative in 2016 but reversed rapidly as the Fed delayed policy tightening. If we see a similar pattern this year, a challenge of 3000 on the S&P is quite possible.